We would be delighted to arrange a no obligation demonstration of our portable Oxygen Concentrator range in the comfort of your own home. 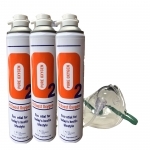 The Oxygenstore have been supplying Oxygen Concentrators in the UK since 2001, we have extensive expierience and are regarded as the UK's Oxygen Specialists. Just call us to arrange a convienient time that suits you, one of our specialist Staff will discuss your requirements and propose several units to you that meet your needs. We will then bring the selected Portable Oxygen Concentrators to your home, go through the operation, the benefits and features of the individual concentrator, including battery duration, any special features and what accessories are included so you can choose which machine you like the best. Please call us on 0345 100 0084 to book a Portable Oxygen Concentrator Demonstration.